ABC, which has been keeping a lid on the Roseanne spinoff in advance of Tuesday's premiere, screened two episodes for critics on Friday with the agreement that they "not discuss, imply or in any other way reveal what happens to the character of Roseanne Conner." According to Daniel Fienberg, "Roseanne's exit from the series is handled in a way that's far more dignified and honorable than Barr-the-producer's exit from the show." He adds: "What The Conners evolves into almost immediately is what it really was at its best last season and probably always was at its best: a blue-collar family sitcom that has become a blue-collar sitcom about an interestingly varied blue-collar family composed of several generations and a selection of exes and only-occasionally-present spouses all just trying to make the best of a messy situation in a midsize Illinois town. The idea that Roseanne was the only comedy on TV tackling blue-collar issues was already a ridiculous piece of myopia that ignored One Day at a Time, Shameless, Speechless, Superstore and several other great pieces of TV. This is but one blue-collar comedy on TV, and it's a decent one. The emphasis that Roseanne put on politics in several early episodes last season is basically gone, but everybody involved with the show last year tried to emphasize that Roseanne was not now, and never really was, a show about politics. It's absolutely still a show about ideology or world-view, but it's that without ever saying 'Trump' or 'Clinton' or 'Democrat' or 'Republican' once. The questions are about how you pay for medical bills or how you raise children or how you handle difference." 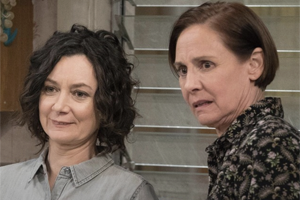 The Conners has a familiar look and pace, and it's better than might be expected after an emergency "star-ectomy"
It's a low benchmark, but The Conners makes the case that it's the best new comedy -- if you can call it a "new comedy"